Communication systems such as the Internet have become part of our daily lives. In any data-transmission system, data are always exposed to noise, and therefore it might be expected that information will be transmitted incorrectly. In practice, however, such problems can be avoided entirely. How is this possible? For explaining this, let us say that we send some information that is either 0 or 1. Now, let us say that the sender and receiver agree that the former will send “000” instead of “0” and “111” instead of “1.” If the receiver receives “010” or “100,” he or she can deduce that the sender in fact sent 0. On the other hand, if the receiver receives a “110” or “101,” he or she can deduce that a 1wassent. Therefore, we can reduce the chance of error by introducing redundancies into the transmission. However, in order to further reduce the chance of an error in this method, it is necessary to indefinitely increase the redundancy. Therefore, it had been commonly believed that in order to reduce the error probability, one had to increase the redundancy indefinitely. However, in 1948, Shannon  showed that by using a certain type of encoding scheme, it is possible to reduce the error probability indefinitely without increasing the redundancy beyond a fixed rate. This was a very surprising result since it was contrary to naive expectations at that time. The distinctive part of Shannon’s method was to treat communication in the symbolic form of 0s and 1s and then to approach the problem of noise using encoding. In practical communication systems such as optical fibers and electrical wires, codes such as 0 and 1 are sent by transforming them into a physical medium. 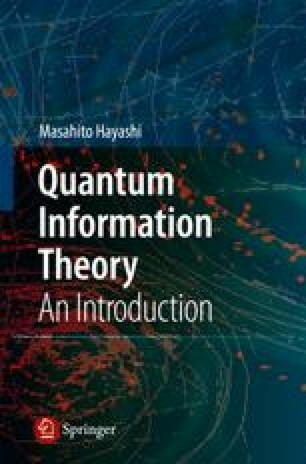 In particular, in order to achieve the theoretical optimal communication speed, we have to treat the physical medium of the communication as a microscopic object, i.e., quantum-mechanical object. In this quantum-mechanical scenario, it is most effective to treat the encoding process not as a transformation of the classical bits, e.g., 0s, 1s, and so on, but as a transformation of the message into a quantum state. Furthermore, the measurement and decoding process can be thought of as a single step wherein the outcome of the quantum-mechanical measurement directly becomes the recovered message.